As I sit here writing this first update – about 31 hours without proper sleep (older sleepers do not have the resilience of young sleepers who seem capable to sleep anywhere and in any body position) – we are mostly troubled not by our clouded heads, but by the clouded and moisture releasing skies – is this really Eretz Israel or have we been transported into a 4th dimension? But why start with the now when you have no idea how we arrived at now – so let’s start, then. The morning was a smooth AC affair – special thanks to Neal Chark for joining us at 4:45 a.m. to come out and ensure a seamless check in for all of us. We moved through security easily, I could feel the eyes of happy parents on us until we disappeared – freedom I am sure never felt so good to you – (and nor will you ever likely know the joy of traveling with 50 of your young best adolescent friends). There was much of the aforementioned sleeping during flight one to Toronto. We had just 40 minutes before boarding for flight two to Tel Aviv. I was thoroughly impressed on the plane with the total amount of junk food that was brought – truly remarkable – only bettered by the amount that ended up on the floor (it scares me to think what many of your children’s bedrooms look like). The flight attendants were actually very complimentary of our students behaviour though apparently they can be loud (hard to imagine that from 50 of our finest!). Finally, after so many hours in the air (16 or so) we arrived in Tel Aviv to cheers from the students – that is always my favourite part – landing in Israel – I am near 20 visits and it just never gets old. I still feel that excitement that resulted in student shrieks. Unfortunately we then had some frustrating news with luggage as three students had their luggage book alternate travel – as you can imagine the paperwork with AC in Israel to follow up on this took beyond forever. Israel may be the start-up nation but they could use a little customer service joy – it does not have to be so hard! So after a long delay we headed out to find Two big beautiful buses waiting for us – so we packed 21 girls on one bus and 29 boys on the other – Lu, Corin and Debbie went with the girls while Matt, Julie, Dorin and I took care of the boys (or it was the other way around – they are not only loud on planes). 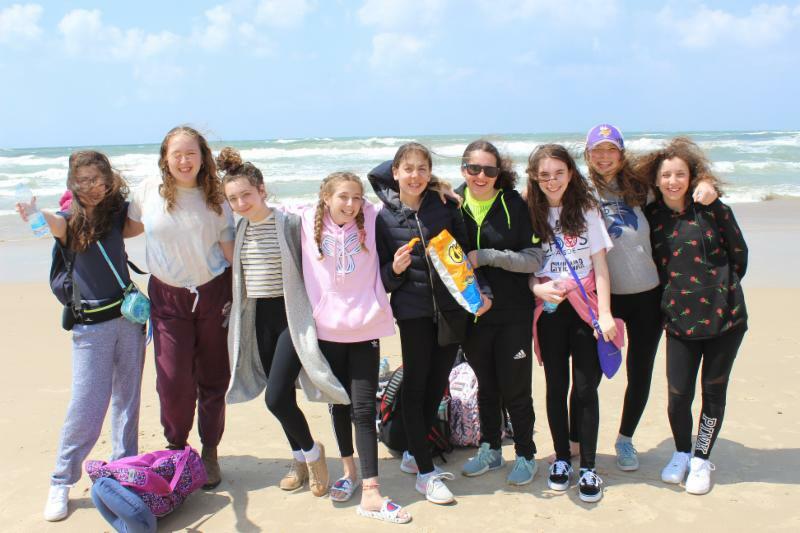 It was raining when we arrived and about 17 degrees C – but as we exchanged money the sun pushed its way through the heavy cloud cover and so we raced, figuratively not literally, to Herzliya Beach to give the students a taste of sun, sand and the gorgeous Mediterranean Sea where a few toes may have been dipped. On this journey and at the beach students were eating the wonderful burekas, cinnamon rolls and chocolate rugela that were waiting for us on arrival. As 30 minutes turned into 45 minutes – the fresh air was good for all of us – but we had to begin our journey up north. So loading back onto the buses we started on the road to Rosh Hanikra. And then a diversion – food was needed again. So a 40 minute mall stop – shwarma was the food choice of the majority (including yours truly who thinks shwarma is almost as good as Froot Loops, though thankfully they are different food groups so I never have to choose). Then was the best part of the day – feeling tired and satiated with full bellies, the student occupants on both buses fell into a deep slumber – it was as if ‘sleep magic’ had been released into the air – 90 minutes of bliss. All good moments must end and we arrived at Rosh Hanikra to pouring rain and gusting winds (the flags were at full horizontal thrust blowing inland). Down the cable car to the spectacular water, caves and caverns below. I have never seen it that rough and stormy and aside from, you know, that little freezing problem, it was awe inspiring to watch the surf force its way through each nook and cranny continuing the development of this area as it has for thousands of years. Again, I want to compliment the students who showed nothing but good cheer and a positive attitude throughout. On our return to the top we walked the 100 m or so to the Lebanon border – yes we were that close but, if you have not been there before, as you would expect it is closed border – it is just the first time on this trip we will have an opportunity to understand Israel’s neighbourhood. 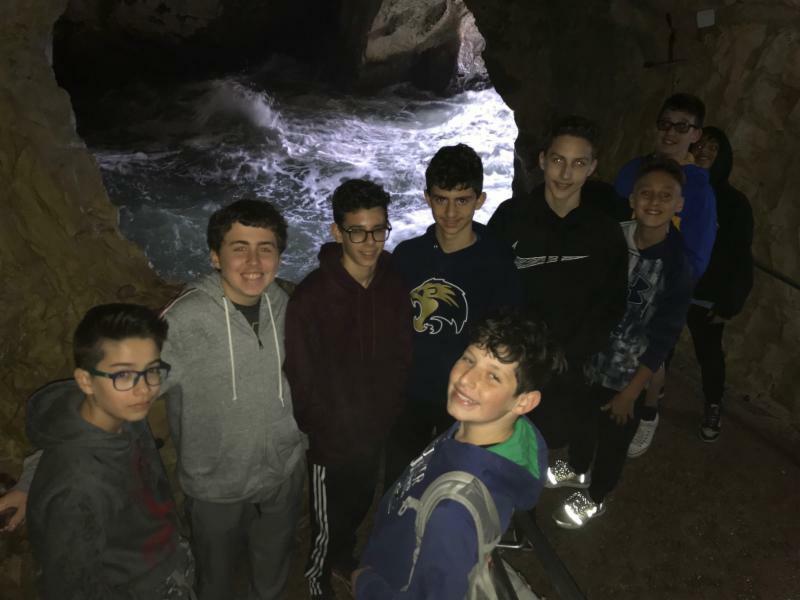 To give you a feel for the length of our day we left Rosh Hanikra around 6 p.m. (we left the airport around noon) – and we then had a 90 minute drive to Kibbutz Dafna – which is right beside our sister school (Har Vagai). Kibbutz Dafna has accommodation and we used to stay here all of the time but for the past 3 years they have been renovating and although we used to laugh at the length of time having seen the result we are most impressed – the rooms are really nice and dinner tonight was very good – especially when you consider that most of us felt a bit out of sorts and did not fully feel like eating dinner. After dinner (around 9 p.m.) we sent the student to their cabins again (they had already checked earlier) with advice to have a shower though I think they were all pretty keen. 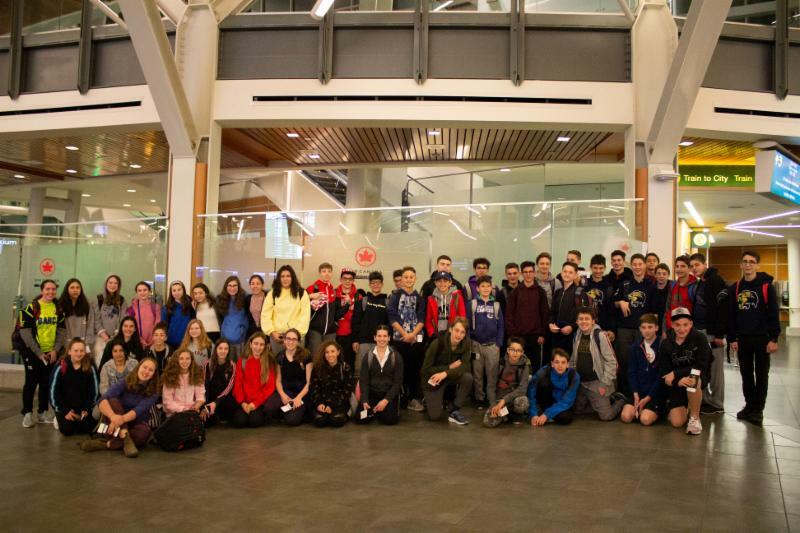 Lights out tonight was 10:30 p.m. – we have done our best to exhaust them in the hope that they will sleep through the night and get onto Israeli time as quickly as possible – we know we have been successful in exhausting all of us chaperones! 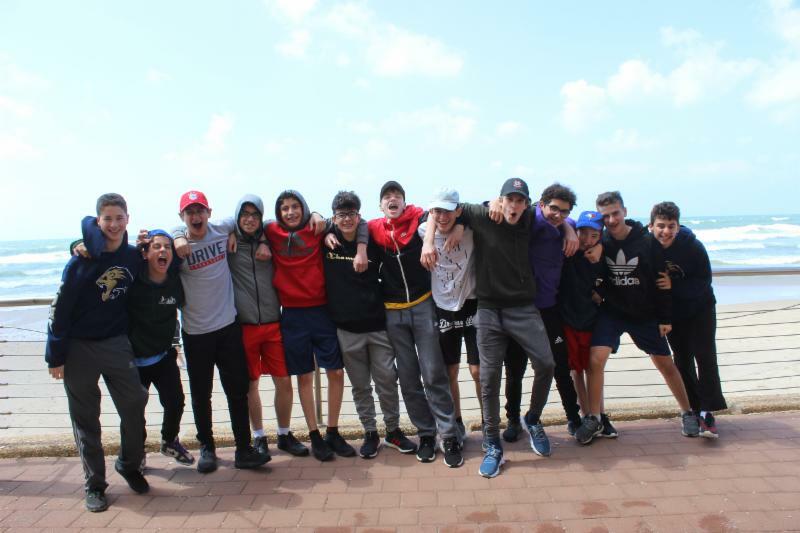 We cannot wait until tomorrow – some of the Israeli students tried to crash our dinner tonight – they are that excited to meet our kids – Mama Bear Dorin made sure to be polite but to send them away so everyone gets to put their best foot forward after a little rest. If you still need a little more, here is a video from our day! Tomorrow is going to be an exciting and full day as we meet the Israeli host students – wait for it… Wishing you all a great day.